Physical fitness is easier to achieve than you believe. Learn how. In one 15-year study “The people who did strength training at least twice a week were 46% less likely to have died for any reason than were those who strength-trained less often or not at all”. I start this section off by giving you tips on how to start training today, with simple bodyweight movements, and a sample “Success Log” to keep track of your progress. I also explore some equipment you can use for more advanced training. Finally, I give you some information on HIIT training. It’s one of the latest ways to get fit, but it has its drawbacks, as I will explain. When I was in school, I did anything I could to avoid gym class, and never played any sports, as I wasn’t very coordinated on top of being skinny. When I was about 16, I started lifting weights, and became good enough to sign up for the State weightlifting championships, although I didn’t compete due to back problems. I lifted until I was about 20, and then quit. Fast-forward to age 57. I hadn’t done any exercise from age 20. Now, I wasn’t overweight, as I still weighed about 120 pounds, and I was really active, but I wasn’t getting any “exercise”. Then, one day, I was at a local warehouse store and saw my first full-suspension mountain bike. I’ll be honest, I bought it because it looked really cool. I lived about 1000 feet from the ocean, and figured I’d just ride it on the bike path. But then, nearby I found a really-cool park with hills and trails, and started riding every day for about an hour. A few years later, when I moved away, I dropped down to 2 hours a day, 3 days a week, and then down to 2 hours once a week, but doing strenuous uphill laps. Because I wanted more of a workout, in 2008, I started doing indoor rock climbing. I progressed up to climbing 1,500 feet a day (straight up), but that wasn’t challenging enough, so I added a backpack carrying weights. I eventually was doing a routine where I was climbing 300 feet with 30 pounds in the pack, then another 300 feet with 35 pounds, 300 with 40, 300 with 45 and 300 feet with 50 pounds. It was a great workout, but I didn’t feel that I was getting my entire body worked out, only the climbing muscles. In addition, by the time I got to the wall, did my climbing and returned home, I had used up 3 or more hours, so I wanted something to give me more benefit in less time. In 2013, at age 69, a guy did a demo on kettlebells at the rock wall, and I was hooked. I bought a set, and started working out 3 days a week.I did that regularly until 2017, when I started going to the gym one day a week, and cut my kettlebell workouts to twice a week. Then, around that time, I had what I can only call a paradigm shift. I had been a typical guy. Working out mainly my arms, shoulders, chest and upper back. The rest of my body was just a platform to support my upper body. Then I learned on YouTube about a movement technique called “Animal Flow”, or more broadly “animal movement”. It involves moving the body in ways that simulate different animals, such as the monkey, bear, lizard, etc. I can’t say exactly why, but I was really drawn to these movements, and started doing them 3 days a week, on days when I wasn’t doing my gym or kettlebell workouts. It was a whole new era for me, as if I’d been numb and unaware previously. I started to experience a whole new level of aliveness. My body felt more alive and I was more aware of it. My movements flowed with much more ease, such as when I had to squat down to get something from under the kitchen sink. Then, as part of my exercise evolution, just last week, I cut down the amount of weight I use for my kettlebell training, and started doing the movements more slowly and with really good form. This is instead of trying to force out some reps with the heaviest weight possible. https://www.movement20xx.com/members?aff=1585. He does offer “full support: our team is always available to answer any questions and help you with the program”, but his course is frankly a lot more expensive than Mike Fitch’s below, at $14.95/mo. There’s also a great step-by-step course available at https://www.animalflow.com/shop/animalflow2/?ref=113. I like Eero’s course for the variety of movements he offers, and I feel that he’s a good choice if you’re in pretty-good shape. The Animal Flow course, taught by Mike Fitch, is more for the beginner, and offers step-by-step instructions. His newest edition includes improved instructions on 26 exercises and 20 sample Flows, and videos are provided as downloadable files and can also be streamed on-line, all for a $49 1-time fee. As is my nature, I continue to explore and experiment with new fitness techniques. I’m working with animal flow and calisthenics these days as well as sandbag training. On my Website at GreatMiddleAge.com, I regularly put up new articles on easier and new ways to get fit, so be sure to go there from time to time and check them out. Of course, better yet, sign up for my newsletter, and you’ll get lots of great info delivered to your inbox regularly. Click on this link now to get connected: https://greatmiddleage.com/newsletter/. Or you can always just click on the “Newsletter” link on GreatMiddleAge.com. I’d love to tell you that I just love to grab my kettlebells and grind through the reps, and I wish it was true. But generally it’s not. I’m a human being, and our nature is to take it easy. So why do I exercise 6 days a week? The answer is simple: I love the way I feel when I exercise. Maybe not during the exercise, but after it. All through the day when my body feels alive. When I feel physically powerful, and that then translates to feeling powerful in general, and empowered to accomplish what I want to in life. I also know the health benefits of exercise, and that helps too. Before anything else, I have to tell you this: You MUST exercise! I wouldn’t be doing the right thing to tell you otherwise. You don’t have to start putting hours at the gym every week, or on the running trail either. You just need to start. Now. Of course, it’s always a good idea to consult with your healthcare provider before starting a fitness routine. Just because you’re a middle age man or woman isn’t an excuse to not exercise. If anything, it’s all the more reason to exercise. If you’re not exercising now, start today. Start slow. Do some pushups, pull-ups and planks. Go for a walk. Just do something! Please! And then, kick it up a notch. Do a little more. Look at the reasons below why you should exercise. But just start now! Tell you what I’m going to do. I really want you to start exercising now. And so I am going to give you a 47-page eBook for free, although I could sell it in the online store. Yes! Click here to download it right now. https://www.youtube.com/watch?v=j57HMjVM7Is – I like this one because he shows the “Beginner” version in the upper right of the screen. https://www.youtube.com/watch?v=L77b57erQ4M – a beginner’s workout, but more intense. https://www.youtube.com/watch?v=_W9B2ffnO5c – also for beginners and he makes it really easy to start. Whew! OK. I hope you’re ready to start today. Yes, today, unless it’s 10pm. But seriously, start right away, even if you only do a few exercises. And be regular. I suggest you workout 6 days a week, and take Sundays off to allow your body to have a break and heal up any minor strains, etc. But you don’t want to be doing weightlifting workouts on the same muscles every day, though. If you’re not ready to start today because you feel you’re just in too bad of shape and it’s too late, take 4 minutes and watch this video: https://www.youtube.com/watch?v=qX9FSZJu448 It could change your life. Really. Got it? Ready to get started? Good! So you really need to keep track of your workouts. Here’s why. 1) It helps to keep you on track. If you have a chart like the one below, and you skip a day, there’s a hole in the chart. You should feel like you weren’t committed that day, and resolve to not do that again. 2) It helps you to keep pushing yourself. If you don’t keep pushing yourself, you’re not going to progress. 20-minute walk on 3 of the other days. Then, for your pushup days, put down how many you did. For your walk days, put down how many minutes you walked. On Sunday, look over your log and see where you have failed, if at all. If you’ve done well, feel good about yourself, and that you’ve accomplished your goal! After a few weeks, if you’re doing 10 pushups every day, then try to increase to 15 a day, or maybe do 10 pushups twice a day. If you’re walking 20 minutes every day, maybe shoot for 25 or even 30. Now, even pushups and walking are a good start, and if you’re doing one of the bodyweight workouts in the videos above, that’s even better. But once you have gotten into good shape, what you really need is to have some equipment that will continue to challenge you in a more intense and measurable way. Based on my experience and research, I suggest a fanbike for cardio and kettlebells for weight training. But before I go on to explain more about that, I want to give you some reasons why you should exercise besides “I’m supposed to”. That’s nice to talk about, but it won’t keep you on track at 7am when you’d rather just snooze an extra half-hour, or at night, when you’d rather watch some TV. “I am what I am today because of the choices I made yesterday”. It improves the quality of your life. The old adage, “Add life to your years, as well as years to your life by exercise,” has considerable merit. A properly designed exercise program will give you more energy to do the activities you enjoy and will enhance your functional capability to do the things you like to do at home, work and play. It rlieves depression. Several noted psychologists have concluded, “Exercise is nature’s best tranquilizers.” Researchers have found, for example, that mild to moderately depressed individuals who engage in aerobic exercise for 15-30 minutes at least every other day typically experience a positive mood swing within two to three weeks. It increases your metabolism. A person’s basal metabolic rate (BMR) is the amount of energy used by the body while awake and in a state of complete rest. The BMR is affected by several things — gender, body composition and activity level.A regular exercise program will help prevent a decline in both your lean body mass and your BMR. Additionally, the need to rely on exercise to maintain a caloric/metabolic rate balance would be lessened if you also incorporate other forms of physical activity into your daily routine (gardening, yard work, parking your car farther away and walking, taking the stairs, etc.). It enhances your self-image. Research has documented the assertion that individuals who exercise regularly feel better about themselves than do sedentary individuals. Strong evidence exists that all factors considered, the more you exercise (to a point), the more your sense of well-being, personal value and self-esteem goes up. Exercise offers an excellent way to reduce stress. Several studies indicate that exercise dissipates negative hormones and other chemicals that build up during periods of stress. Exercise also generates a period of substantial emotional and physical relaxation that sets in about an hour and a half after a relatively intense bout of physical activity. It reduces the risk of heart disease. Experts have found that non-exercisers have two times the risk of heart disease than individuals who exercise regularly. Exercise has been found to increase the ability of the blood to clear away clots in the blood vessels.Furthermore, individuals who exercise on a regular basis are at least 20 percent less likely to suffer a fatal heart attack. The point to remember is that your heart needs more than love — it needs the beneficial consequences of exercise, which include reduced demand on the heart to pump blood, increased stroke volume, lowered heart rate and less wear on your cardiovascular system. Being fit can slow down the aging process. It is never too late to improve the functional quality of your life. Solid exercise can slow the age-related decline in the various physiological systems that many individuals experience as they get older. For example, instead of losing aerobic fitness, as older adults often do, proper exercise can help to maintain your aerobic capacity as you age. 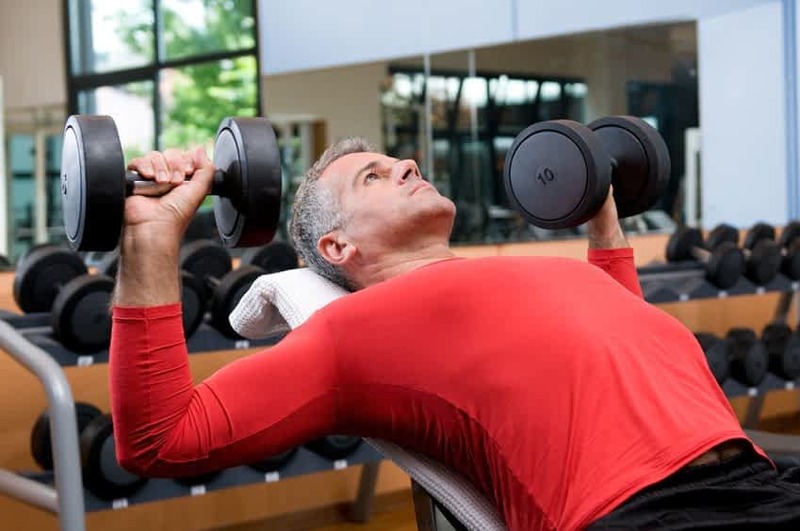 Furthermore, sound strength training exercise can reverse the loss of muscular fitness that typically occurs in older adults when they haven’t been exercising or been active. Exercise increases the “good” (HDL) cholesterol. Exercise is one of the few voluntary activities that is effective in raising your level of HDL — the type of cholesterol that lowers your risk of heart disease. In fact, research indicates that for every 1 percent increase in HDL you experience, you incur a 2 to 3 percent reduction in your risk for heart disease. At the same time, exercise increases our level of HDL, it lowers the LDL (the “bad” cholesterol). It improves the quality of sleep. Researchers have found that exercisers go to sleep more quickly, sleep more soundly, and are more refreshed than individuals who do not exercise. Being fit keeps your mind sharper. Numerous studies have shown that individuals who exercise regularly have better memories, better reaction times and better levels of concentration than non-exercisers. All factors considered, research suggests that exercise can do for your mind what it does for your body — energize and revitalize it! In a recent study, researchers analyzed data on 30,162 people aged 65 and older, with an average age of 74. About 10 percent of them regularly did strength training. In a 15-year period, almost a third of the participants died. The people who did strength training at least twice a week were 46% less likely to have died for any reason than were those who strength-trained less often or not at all. 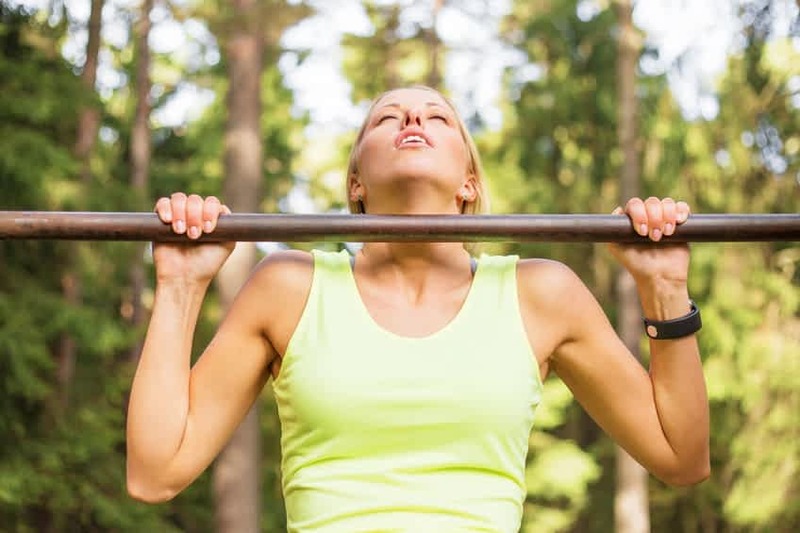 The strength-training group was 41 percent less likely to have died because of a heart problem and 19 percent less likely to have died from cancer. The study suggested that people do moderate-to-high-intensity muscle-strengthening exercises 2 or more days every week. The exercises, such as weightlifting, stair climbing and using resistance bands, should work all major muscle groups. The study suggests strength training as part of an overall activity program that also includes aerobic activity. In this section, I will focus on several different workouts, two of which I use myself. One is the kettlebell workout, which is basically a musculo-skeletal workout, and the other is a cardio-pulmonary workout using an old-school Schwinn AirDyne fanbike. A great fanbike to get is the Xebex FanBike. 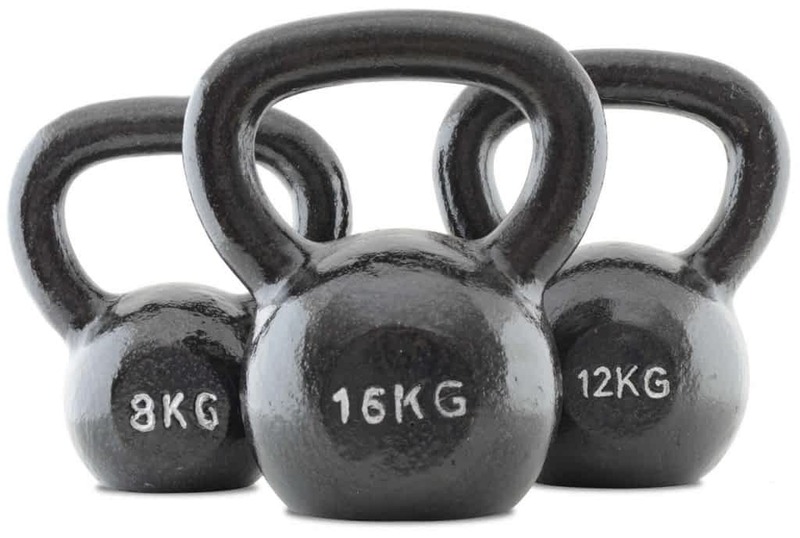 I have my own set of kettlebells ranging in weight from 8 kg to 32 kg (about 18 pounds to 81 pounds). Because of this, I am able to work out anytime I want. In less than half the time it would take to drive to the gym, work-out, and drive home, I can do my workout. In addition, the kettlebells only take up a space about 12 inches by 24 inches, and I can do my entire workout in a space that’s only 72 inches by 24 inches! I’ve also found that by having my own kettlebells, I’m a lot less likely to make excuses and put off working out. I also multitask, doing a set of exercises, and then doing some work on my computer or other small tasks before the next set. Another advantage to kettlebells is that you can do movements with them that you can’t do without great difficulty by using dumbbells, for example. A few of these exercises would be the halo, kettlebell swing, as well as the Great Circle and the cannonball press, movements which I developed. I’ll be offering a course showing what exercises I do as well as how I do them on my Website at GreatMiddleAge.com. I also regularly put up new articles on easier ways to get fit and lose weight, so be sure to go there from time to time and check them out. Of course, if you sign up for my newsletter, you’ll get lots of great info delivered to your inbox regularly. Click on this link now to get connected: https://greatmiddleage.com/newsletter/. Or you can always just click on the “Newsletter” link on GreatMiddleAge.com. There are other advantages to kettlebells, but to me these are the most important ones. If you’re interested in trying kettlebells out, you can either go to a gym that has them, and which will let you do a trial workout, or you can buy one to try out at a place like Walmart. Maybe I’m a purist, but I do suggest that you get only the cast-iron kettlebells. I just looked at the Walmart website to check on their pricing, and I noticed they had some that were “vinyl, cement-filled design”. Not what I’d buy. LOL! Also, a friend of mine said that he has seen the cheap ones at the gym, and they were broken. Otherwise, just buy them wherever you want to. Again, I do suggest getting only cast-iron kettlebells. And if you buy online, be sure you know what the shipping cost will be. The other piece of equipment that I use almost every day is the Schwinn AirDyne. I love this bike! Let me tell you one thing I really like about this bike. The suggested amount of exercise time per week is 150 minutes. If you look at it as a half-hour a day, 5 days a week, it can still look like too much work. Here’s how you can get your exercise time in almost painlessly. Use the fanbike for a 10-minute session in the morning, and then another 10-minute session in the afternoon. Do that, and you’ve got 140 minutes in a week, and that’s close enough for me. I keep my bike in my home-office, so it’s a great way to take a break and get my body moving without even leaving my office. You could, or course, put the bike in a place where you could watch TV (whatever “TV” is?) and ride too. Because a fanbike starts out really easy, and then gets harder to ride as you go faster, it is perfect for any level of fitness. Move your legs and arms faster or slower to determine the amount of resistance you experience in real time, without having to stop to adjust knobs and settings. So start out slow, and after a few minutes, if you feel like it, pedal a little faster. If that gets too hard, then all you have to do is slow down a bit and the resistance drops automatically. Then, if in a minute you feel like you want to make your workout more intense, go a bit faster, and it gets a little harder to pedal. This continues until you will probably run out of energy and strength before you go as fast as possible on a fanbike. I’ve seen videos of some pretty-fit looking guys who were trashed after a 1-minute fanbikeworkout. Or this one: https://www.youtube.com/watch?v=umD8P4x2qbY Notice how about at the 40-second mark, the guy starts running out of energy. Want to do HIIT (High Intensity Interval Training)? This is the machine for it. Check out this video (warning: bad language) https://www.youtube.com/watch?v=k3kiQ4lhD4g Notice the 2 muscular guys who are totally wasted after only 20 seconds! On the other hand, if you are totally out of shape, and want to slowly work into shape, this is also the bike for you. Seriously, even if I had some terrible illness, and could barely walk, this is the exercise I would choose. Here’s the bottom line: I believe that for home use for most people, any of these bikes would be great. The Schwinn AirDyne Pro sells for $999, while the Assault AirBike is $799 and the Xebex is $739. I don’t remember where I got my AirDyne Model AD4, but it’s a great piece of equipment. It was introduced in 1978 and was made until 2002, and the one I have is probably 25+ years old and it still works great, although it’s a bit noisy. There are a number of things I love about the AirDyne. The first thing is that it can exercise both the upper and lower body at the same time. To me this is extremely important. You can exercise the legs alone, or the arms alone, or everything at once. In addition, you can vary the arms exercise by changing your hand position. By this I mean that you can either have your palms facing downward on the handles which will emphasize your upper back muscles more, or you can have your palms facing upward, which emphasizes the biceps more. 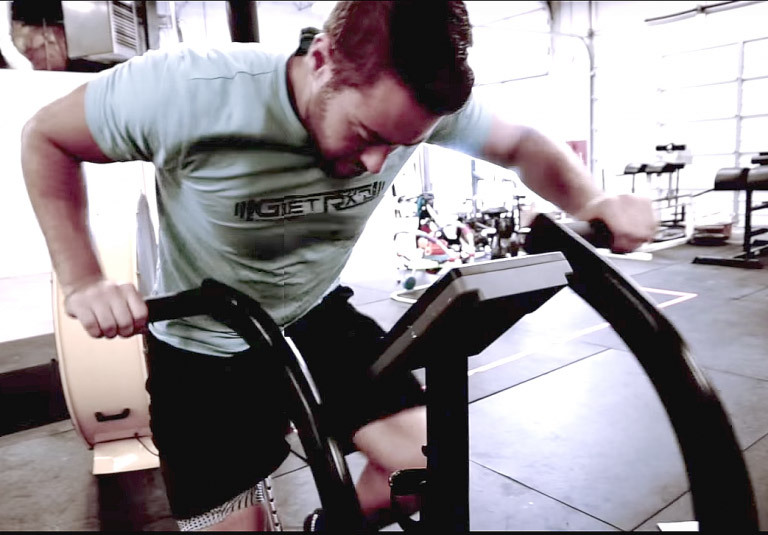 Here’s a video that claims to show 50 different exercises with the AirDyne. youtube.com/watch?v=tyhTm-7_bGU There are some of them that are pretty risky-looking and which I don’t recommend, but you can see the variety you can create with this bike. These days, the AirDyne is no longer made by the original Schwinn company. I have checked out the new company’s cheaper models and do not suggest them at all. The one I tried, which I believe was the AD6, had very little resistance available, even at the highest speed. In addition, it did not feel very sturdy. They do make an AirDyne Pro, which I write about above, but it’s $999. Look, here’s the deal as I see it. You need to exercise. Period. For the rest of your life. You can buy a cheesy piece of equipment that won’t work that well, and which you’ll outgrow in a few months if you’re serious about getting fit, and then you’ll have to sell it, lose a bunch of money and then buy the high-quality one you should have bought in the first place. Or, you can buy a high-quality fan-bike that’ll be a pleasure to use, and it will last you for the next 30 years, like mine has. There are3 options to use for a gym-grade version of the AirDyne, which was really a home-quality bike. There’s the Schwinn AirDyne AD Pro, the Assault AirBike, the Rogue Echo and the Xebex. Quality-wise, I believe they’re all good quality. I have never tried out the Schwinn, as there are none in my area to try. I do not suggest their cheaper bikes, as I did try one of the lower-grade ones and there was very-little resistance to exercise with. There are lots of other fanbikes that you can get for around $200-$300. If you can actually go and try one for yourself, and it feels like a solid bike, well-made and gives you a great workout, then go ahead and buy it. 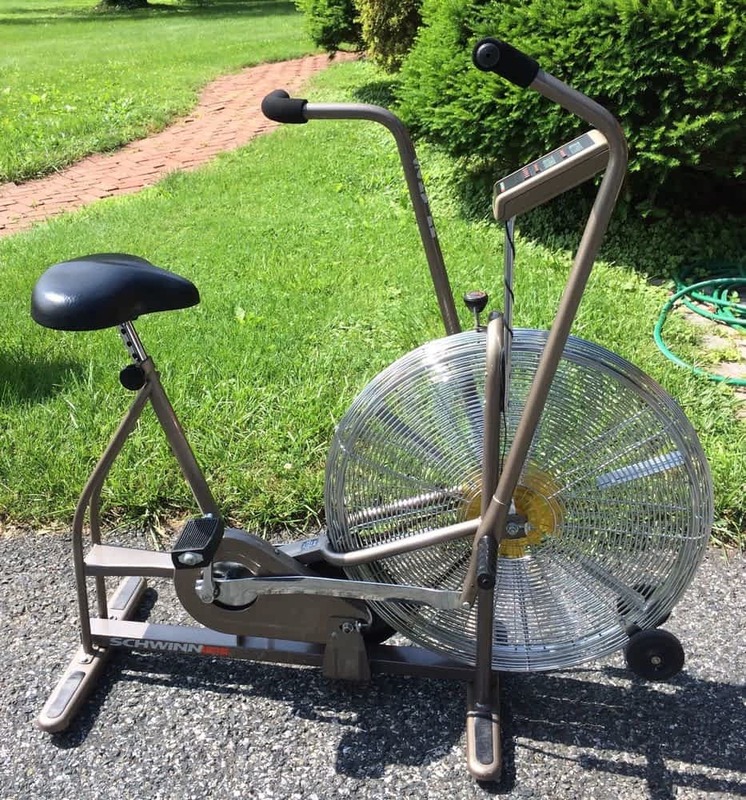 If you really get in shape, you’ll probably wind up selling it and getting a “real” fanbike, but that’s up to you. I did try out an Assault, and it was a good bike. The Xebex was actually launched about a year after the Assault, and was designed to improve on the Assault. Here’s a video that compares the Schwinn, the Assault and the Xebex: youtube.com/watch?v=5bUOd9W6iP4 . The Xebex has made a number of improvements over the Assault, which the video will explain. Exercises like “moderate cycling” and “cross-country running” burn 563 calories an hour, while the AirBike can burn up to 66 calories a minute or almost 4,000 calories an hour! This means that a full-on 10-minute fanbike workout would burn more calories than a 1-hour cross-country run! How’s that for using your time and effort well-spent? That having been said, I also believe that the old-school AirDyne (like the brown one in the photo above) is a very good bike. Maybe it’s about 50% as good as the Xebex FanBike. I have seen them on eBay for around $300-$400, but many, if not most, of them you will have to pick up from the seller, as they will not ship the bike. I have also seen them on Craigslist for about the same price, but you’ll have shipping unless you pick it up. If you just can’t afford the Xebex or other AirBikes, then keep checking, and maybe you’ll find an AirDyne. If you do buy a used one, make sure it’s in OK condition, although these bikes are really sturdy, so they should be OK.
HIIT, or high-intensity interval training, is a training technique in which you give all-out effort through quick, intense bursts of exercise, followed by short recovery periods. The results of one study showed “Subjects using this method trained 3 times per week obtained gains similar to what would be expected from subjects who did steady state (50–70% VO2max) training five times per week.“ This shows that there could be a time-saving benefit, but that the gains were similar to people who just did regular exercise. The question here, is whether or not someone could keep up the commitment and energy requirements of High Intensity Interval Training, as it requires bursts of 80 to 90% of maximum capacity. If you have an interest in this training method, I would suggest you do some research on the Internet. If you’re still interested, then you can give it a try and see how it works for you. Keep in mind that if you’re over 50, working at that high a level of intensity can put substantial strains on your muscles, joints, heart, lungs and other body parts. Obviously some guys who come to this site will range from great shape to barely walking or even less. Be sensible and don’t overdo things. See your healthcare provider, and ask their advice on what to do and what to be careful about. To see some information about a study with using HIIT for guys over 62, you may wish to go to http://medicalxpress.com/news/2015-11-high-intensity-interval-beneficial-older-men.html “The results of the present study indicate that low-volume, low-frequency HIIT programs are a feasible and effective method of improving indices of peak muscular power in sedentary but otherwise healthy aging men,” the authors write. In this article about HIIT at foxnews.com/health/2015/11/30/high-intensity-interval-training-offers-short-sweet-and-effective-workout-routine.html – it shows that “Much of the data involves people over 50 years of age, who stand to reap more of its benefits; after 50, people start losing muscle mass, especially the fast-twitch fibers that enable everyday activities like climbing stairs or recovering from a stumble”. You’ll find great info, some nice videos and also several different fanbike routines. It’s important to note that this article refers to possible causes, and also in endurance athletes. 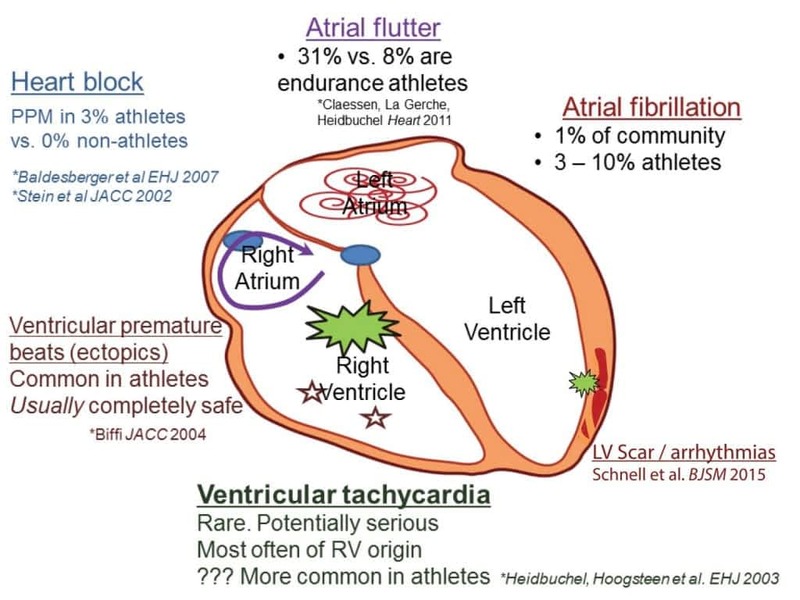 But to me, the important part is that it is possible that intense exercise can cause damage to the heart, and that this (my opinion) may be amplified when the exercise is performed by people of a more-mature age. So my suggestion, besides talking to your healthcare provider, is to be sensible. Workout hard, but don’t get crazy and push your heart to the limit too much. Good solid workouts with moderate exercise will provide all of the benefits you need. Remember, you are exercising for good health and longevity, not to compete in the Olympics or mixed martial arts. These days bodyweight training is very popular. I like the idea that it’s something that can be done with no equipment, as that not only saves people money, but it allows them in some cases to do a workout the matter where they are at. The exception to that is that there are a number of bodyweight exercises that require things like a chinup bar, a sturdy frame for parallel-bar dips, etc. The reason that I’m not big on bodyweight training is that to me, fitness training is all about continuing to challenge your fitness level. In some cases, with bodyweight training, you can have some challenges, such as doing push-ups with your feet on a chair, doing several sets of each exercise, etc. but once you’ve gotten past that point you really have nowhere to go. 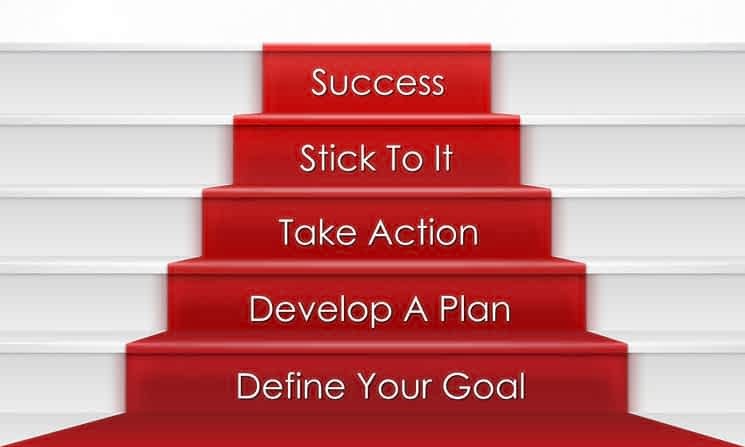 So, if this is what it takes to get you started, then go for it. But I still believe that you need to use training that allows you to keep track of your progress, and which can continue to challenge you to increase your workout. For myself, I always keep an exercise record or log so that I know not only how hard to challenge myself in my current work out, but also so that I have a standard that I can work with in order to increase my fitness. Legs and arms – one minute at a resistance of 3.0 – Level Two…etc. Now, after I’ve been able to work out at this level for perhaps two weeks, then I might raise my resistance starting at Level One by .5. Thus, for example, my legs only session at level One would be at a resistance of 2.5 instead of 2.0. In this way, I can continue to challenge my fitness level, and increase it. If instead, I’m doing a bodyweight movement of running in place, all I can basically do is increase the time I’m running, but this will not necessarily increase my fitness level. The same goes for my kettlebell workouts. I always keep a log of what movements I’m doing, what weight I’m using, and how many repetitions I’m doing. In this way, I can continue to challenge myself. These are reasons why I use kettlebell and fanbike training. Simple to do, can do at home, don’t take a lot of time and easy to measure. To me, all these add up to a fitness program that I can continue to do month after month, and year after year. On my Website at GreatMiddleAge.com, I regularly put up new articles on easier ways to get fit and lose weight, so be sure to go there from time to time and check them out. Of course, if you sign up for my newsletter, you’ll get lots of great info delivered to your inbox regularly. Click on this link now to get connected: https://greatmiddleage.com/newsletter/. Or you can always just click on the “Newsletter” link on GreatMiddleAge.com.